WASHINGTON (CNN) -- President Obama and Iraqi Prime Minister Nuri al-Maliki voiced cautious optimism regarding the situation in Iraq Wednesday, noting greater stability and decreased violence as U.S. troops continue to cede control to their Iraqi counterparts. President Obama and Iraqi Prime Minister Nuri al-Maliki talk Wednesday at the White House. "I have no doubt that there will be some tough days ahead," Obama said during a joint appearance of the leaders at the White House. "There are still those who want to foment sectarian conflict. ... But make no mistake, those efforts will fail," he added. The president said he is committed to moving forward with a pledge to remove all American combat brigades from Iraq by the end of August 2010, as well as all U.S. troops by the end of 2011. Al-Maliki promised the Iraqi government would step up its efforts to prevent a return of widespread sectarian violence. 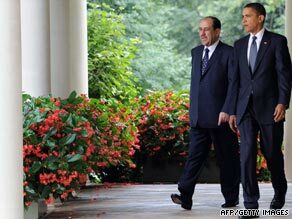 In addition to meeting with Obama, al-Maliki is scheduled to sit down with Vice President Joe Biden. He will also meet with the secretaries of State, Defense and Treasury, and with House Speaker Nancy Pelosi. Some foreign policy experts have expressed concern that as the United States pivots from Iraq to Afghanistan, Iraq and its problems will be ignored. Responding to that criticism, one senior administration official said this week, "Our goal is, in fact as we formalize the relationship, to concentrate on other areas," but he suggested that Iraq would remain a U.S. priority. Hours before the two leaders met, at least five Iranian pilgrims were killed and dozens more wounded earlier Wednesday in an attack northeast of Baghdad. The violence came a day after a spate of bombings left at least 22 Iraqis dead and about 150 wounded. CNN's Jomana Karadsheh and Dan Lothian contributed to this report.